A dime is about 1 mm thick and a nickel is about twice as thick as a dime; large grains of sand can be about 2 mm in size, so this gives you a concrete sense of just how miniscule the orchid really is. 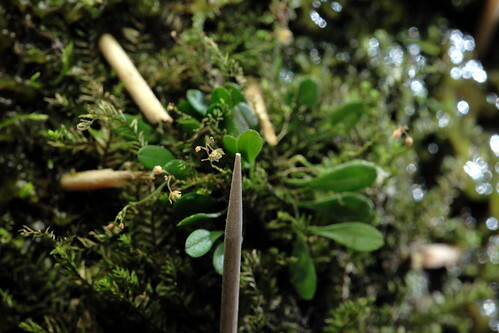 Here is the Platystele jungermannioides in bloom next to a toothpick…a freaking toothpick!! In addition to Ecuador, the orchid is found in Mexico, Guatemala, Costa Rica, and Panama. Ahhh….the wonders of nature. Incroyable!! ← So Much Orchid Growth! Whilst you may have considered this Platystele species as the smallest orchid in the world it could be of interest to point out three challengers from Europe; Malaxis monophyllos, Hammarby paludosa and especially Herminium monorchis. All of these three have flowers measuring maximum 2 mm in size. There are at least 3 – 5 others that have a flower size of between 2/3 – 5 mm, namely; Liparis loeselii, Neottia cordata, Pseudorchis albida, Dactylorhiza viridis, and maybe Goodyera repens and Corallorhiza trifida.